These none slip bath appliques make your bath safer without making it look ridiculous. Provided on a paper backing, you clean and dry your bath throughly, carefully position, take off the paper back and press firmly into place, smoothed down the edges. Immediately your bath is a safer place with these bath appliques helping to prevent slips and falls. A well as the texture underfoot, having visible white strips increases confidence so people are surer underfoot. As well as helping safety, theses batch appliques are practical, easily applied, they stick firmly and are easy to clean. 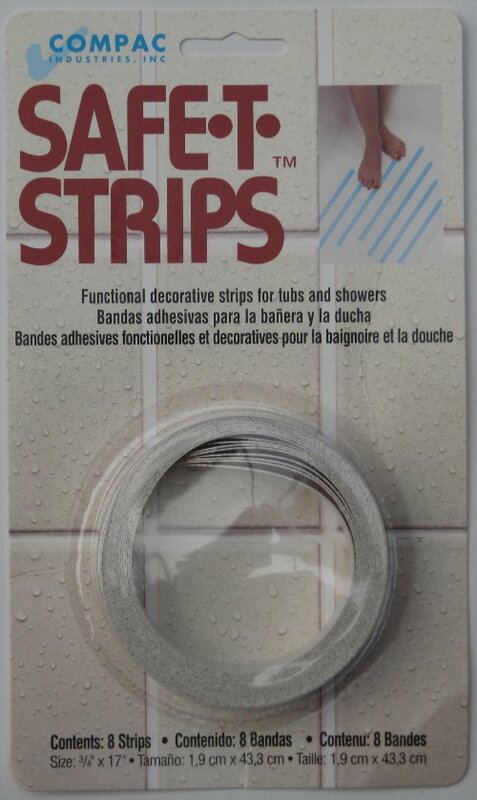 You can get creative too and put the Safe T Strips bath appliques on your floor, the wall people hold onto which gets steamed up, your shower, your stair steps and more. Safe T Strips text, images and video are copyright.